A convenient, comfortable and economical way to enjoy your family camping experience. 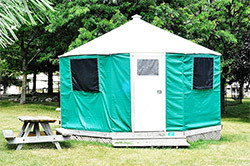 Canadian Habitats, sometimes referred to as Yurts, are spacious, full frame camping shelters. Ranger Smith™ describes them as "soft sided" accommodation. Each Habitat sits up off the ground on a solid wooden deck floor. There is a peaked dome roof, eight full height brightly coloured sidewalls, an entrance door with private keylock, interior night lighting, and electrical service (hydro). Habitats without hydro are also available for a reduced cost. Engineered and manufactured to withstand high winds, Canadian Habitats have been used on expeditions in the Himalayan Mountains. Four, extra large vista view windows with screens and interior privacy closures let you watch the magnificent sunrises and spectacular sunsets in the comfort and privacy of your own Habitat. For extra ventilation, each Habitat features a vent cap. Every Canadian Habitat sits high and dry off the ground, on a site with its own picnic table and in ground fire pit. Water service and comfort stations with free hot showers are located nearby. Enjoy the great outdoors without having to own or maintain a recreational vehicle or tenting equipment. 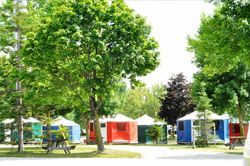 Our furnished Canadian Habitats combine many conveniences and comforts with the freedom and adventure of camping. Best of all, you don't have to pack it, tow it, set it up, take it down, maintain it, or store it. Your private Habitat will be waiting for you upon your arrival. Just walk in and make yourself feel at home. Our Canadian Habitats have approximately 200 square feet of full height floor area. Canadian Habitats are furnished with a full size futon that converts from a sitting couch by day into a double sleeping bed with a comfy high-density foam mattress and single bunk beds for two. Other interior furnishings include a table and four chairs. There is interior light provided with 15 amp electrical service. Furnished for 4, each Habitat will sleep 4-6 people comfortably. Sleeping cots are available to rent. Every Habitat is provided with an outdoor picnic table and an in ground fire pit. Furnished Canadian Habitats are designed and priced for single family or couple use. 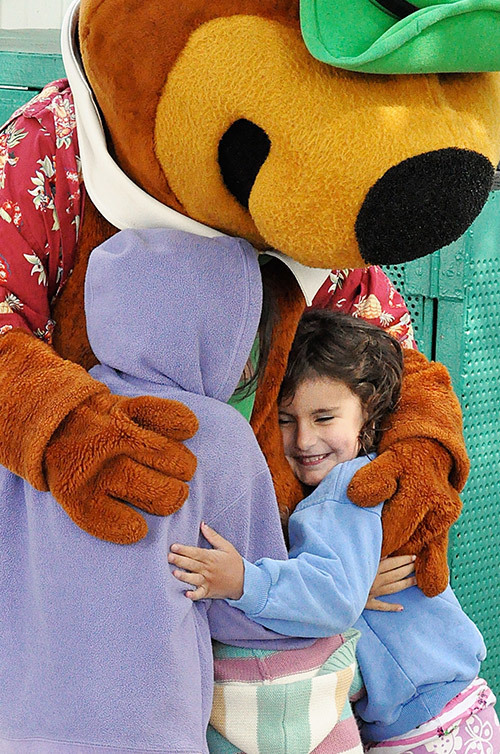 Included is the use of all park facilities, including full size in ground heated swimming pool, walking trails, daily activities, theme weekends, wagon ride, Yogi Bear™ Cartoons, etc. Just bring your sleeping bag or bedding, and the usual camping/travel conveniences. Don't forget your toothbrush, pillow, towel, etc. (teddy bears are optional). 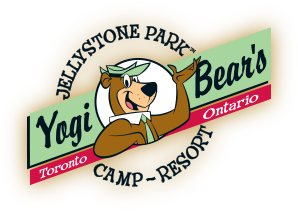 Our camp store has most items that are often forgotten, including sleeping bags for adults and children. Habitats are similar to a tent and we cannot guarantee that it will be weatherproof. Please be advised that under certain weather conditions they may leak. These are outdoor sleeping accommodations therefore insects may sometimes be found inside the habitats. Habitats are part of the outdoor camping experience. 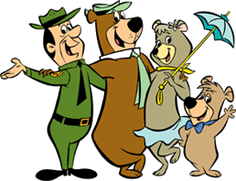 Like bare bones camping cabins, Habitats are not insulated, heated or air-conditioned. They are a cross between a camping cabin and a tent. Please come prepared for variable weather conditions. Micro heaters are also available for rent for those occasional chilly nights. Habitats are generally insect free. However, food, drinks, and moisture will attract pests. To prevent or avoid unpleasant surprises, open food and drinks should not be stored inside Habitats at any time. Expect the unexpected surprises common to all outdoor recreational activities. Remember the Scout's Motto: Be Prepared. Smoking and cooking are not permitted inside Habitats. An in ground fire pit and picnic table are provided for your convenience. Tents and RVs are not allowed on Habitat sites. Sorry, pets are not allowed in Habitats or on Habitat sites. View the rates for our Canadian Habitats and make your reservation today! Visit our Rates & Reservations page. 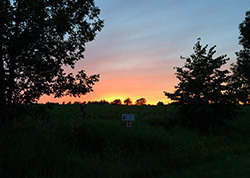 This is one of the best perks of our beautiful natural surroundings! See the sites and get some exercise and fresh air on a hike.